SupportInstallation & TroubleshootingStill Need Help? 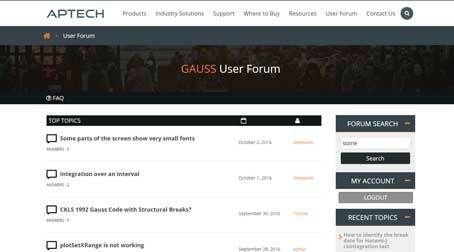 Many users in the GAUSS community may have the same questions that you do. The User Forum is a great place find answers to common issues. On the Activation Window, enter your License Activation Key that has been provided to you, and press [NEXT]. On the Activation Window, after you have entered your License Key, take a screenshot of Activation Window after you have pressed the [NEXT] button. There will either be a successful activation or an error message displayed. Copy and paste your Activation Window screenshot into a Support Ticket Request. Press the [DIAGNOSTIC] button and take a screenshot of that window. Copy and paste your Diagnostic Window screenshot into the SAME Support Ticket that you created above in Step 3. At the bottom of the Support Ticket web form, there is an option to [Choose File]. Browse to your GAUSSHOME directory. Attach any *.lic files. On the License Manager Error Window, press the [Screenshot] button and take a screenshot. Copy and paste your License Manager Error Window screenshot into a Support Ticket Request. At the bottom of the Support Ticket web form, there is an option to [Choose File]. Browse to your GAUSSHOME directory: Attach any *.lic files.